Personalized Car Shape Address Plaque - - custom made address sign for your home or business in the shape of a typical SUV. Made in USA. 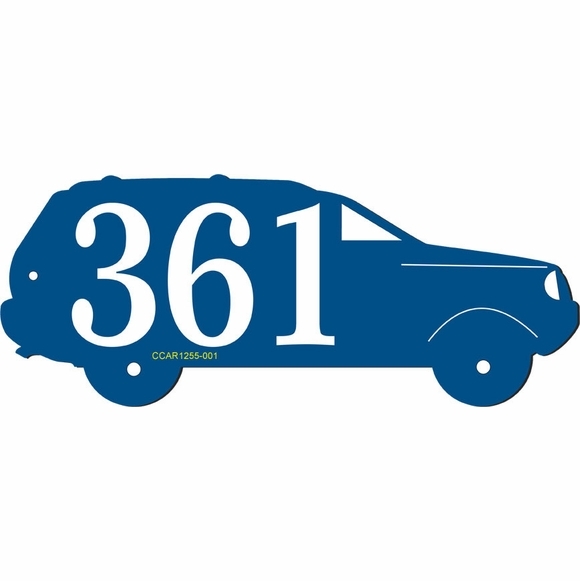 If you are an avid car aficionado or SUV owner, this automobile shaped house number sign can be an eye-catching and personal introduction to your home. 12" x 5-1/2" sign with one line of personalization. Wall mount. Special shape. Holds one line of three (3) large 3.5" characters. Note: the style number you see on the sample car is for internal use only and not part of your custom sign. Dimensions: 12"W x 5-1/2"H x 1/8". Personalized SUV address sign crafted in the USA. Click the links in Related Products to see more special shape novelty signs.